The Corona program was a series of American strategic reconnaissance satellites produced and operated by the Central Intelligence Agency Directorate of Science & Technology with substantial assistance from the U.S. Air Force. The Corona satellites were used for photographic surveillance beginning in June 1959 and ending in May 1972. The Corona program was officially declassified on February 22, 1995. The name of this program is “Corona” was a codeword, not an acronym. 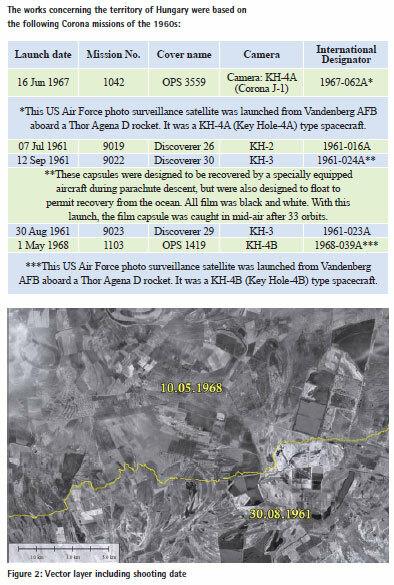 There were 144 Corona satellites launched, of which 102 returned usable photographs. The Corona satellites used special 70 millimeter film with a 24-inch (610 mm) focal length camera. Manufactured by Eastman Kodak, the film was initially 0.0003 inches (7.6 μm) thick, with a resolution of 170 lines per 0.04 inches (1.0 mm) of film. The contrast was 2-to-1 (Brown 1996). The cameras were manufactured by the Itek Corporation, the lens designed for the cameras was based on German Zeiss Tessar lenses (Lewis 2002). By digitizing the best quality standardized photographs, the achievable spatial resolution is 1.5 m. However, 0.91 m resolution was also applied, and during a test, 0.3 m spatial resolution photo was taken too (Chun 2006). The resulting photo mosaic generated by the Interspect Research Group has 2.5 m spatial resolution. Coronas were launched by a Thor- Agena rocket. 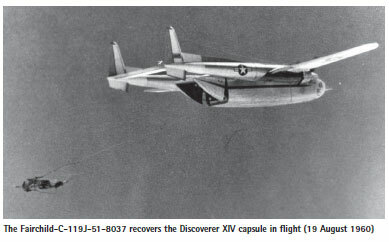 The film was brought back by reentry capsule developed by the General Electric, which separated from the satellite and fell to earth, parachutes deployed at 18 km, and the capsule was caught in mid-air by a passing airplane towing an airborne claw. The photographs digitized by the USGS arrived in four parts; the first task was compiling the original unity. It required geometric reconstruction, during which the geometry of upturned edges of overlapping scanned film strips was restored leaving out the blurred sections. After the restoration of film strips, the screening for ground control points (GCPs) was launched. The image georeference was carried out by two methods. With multipoint registration the less overlapping images have been synchronized by GCPs (40 – 170 GCPs/ image) measured in geodetic survey and transformation synchronized for image-pairs (6000 – 8000 points). Here Delaunay Triangulation was applied, because it is exactly preserve the location of each entered GCP. Wherein the base-pairs have allowed stereo models were applied. Finally, in both cases the images were rectified onto surface model by bilinear interpolation resampling. 650 meters of the blurred edges of rectified images have been left out due to resolution reduction and image blur. Then cloud cover- and cloud shadow-free seamless mosaic was created for the 80% of the country. The resulting panchromatic photo map has 2.5 m spatial resolution; it is well- interpretable for land-cover. The Interspect and the Global Mapper software were applied to perform the task. For collecting GCPs Topcon Hiper SR geodesy GPSs were used. As the adjustment quality depends on GCPs’ quality, these measurements have been conducted particularly carefully. The location of used photographs which were taken on different days is represented within the mosaic by opening a vector layer with accuracy of 1 m (Figure 2). For easier handling the mosaic was cut into sections of 48 x 32 km (19200 x 12800 pixel). 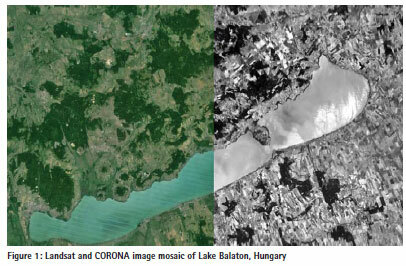 The images will be used for land cover, climate change and biodiversity studies. Brown, Stewart F. “America’s First Eyes in Space.” Popular Science. February 1996, p. 46. Lewis, Jonathan E. Spy Capitalism: Itek and the CIA. New Haven, Conn.: Yale University Press, 2002.